UPDATED: To ensure we’re comparing like with like, the table has been updated to include provisional figures from August to December 2016, as the figures for this period in 2017 are still provisional. Figures for May to July are final for both 2016 and 2017. Apprenticeship starts were down 23 per cent in December on the same period in 2016, according to provisional statistics published by the Department for Education this morning. There were 16,700 starts that month in 2017, down from 21,600 provisionally reported in 2016. This will be viewed as more discouraging news for the government, as it attempts to hit its target of three million apprenticeship starts by 2020. Mark Dawe, the chief executive of Association of Employment and Learning Providers, said that “another month has passed and nothing has been done”. He urged the government to stop charging non-levy-paying companies for hiring apprentices under the age of 25 for at least a year. “We need more young people starting apprenticeships at levels two and three – good for social mobility and good for small business,” he said. The figures from August 2017 onwards remain provisional, and the DfE stresses that they are subject to change. Starts for recent months have generally been revised up since they were first published; for example, November starts now stand at 32,500, up 5,500 or 20 per cent since the month was first reported in February. The Conservative government first introduced its target for three million apprenticeship starts in 2015, and repeated it in last year’s election manifesto. Tim Thomas, the director of employment and skills at manufacturing body EEF, claimed the latest figures as “the final signal to government that now is the time for a review and change”. “Since the levy was introduced nearly a year ago, we have seen a worrying fall in the number of new apprenticeships,” said Jane Gratton, head of business environment and skills policy at the British Chambers of Commerce. The government had hoped that the levy would help drive up starts, by forcing more employers to invest in apprenticeships. 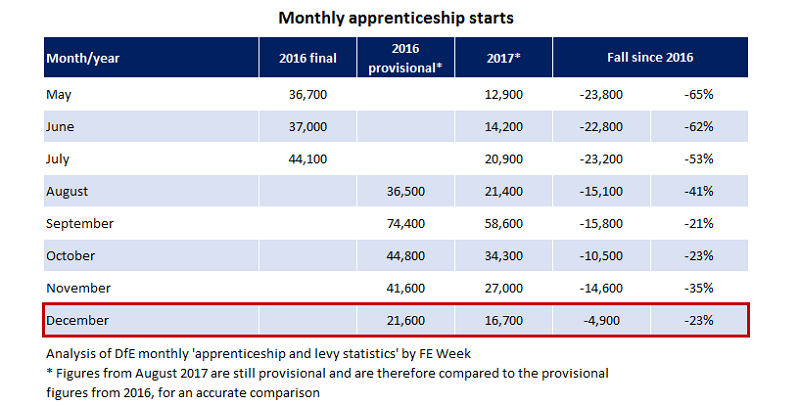 Speaking at last week’s Annual Apprenticeship Conference, the boss of the Institute for Apprenticeships claimed that it was a myth that starts had plummeted since the introduction of the levy last year. Sir Gerry Berragan admitted that while starts were indeed down, the drop is now closer to “about 30 per cent” – rather than the 60-per-cent fall recorded at one point. During an exclusive FE Week interview last month, skills minister Anne Milton revealed she expected to see a surge in apprenticeship starts by September. The skills minister did not comment directly on today’s overall figures, but did mention there had been a rise in the number of starts on apprenticeship standards and at higher levels. “We want to see more people doing an apprenticeship with all the opportunities it provides. However it’s important not to sacrifice quality for quantity,” she said. “I’m pleased to see an increase in people starting apprenticeships designed under our higher-quality standards, which we are developing with businesses so those programmes meet the needs of employers and apprentices. With only 246 Trailblazer Standards approved for delivery and nearly 300 still being worked on, we are not going to see a real ‘surge’ in new apprenticeship starts towards the 3 million target. We have just not made enough progress in the last 5 years.